Staring into a fire can be a hypnotic experience, a Rorschach test where dancing flames create flickering illusions. The transient nature of drifting sparks may provoke musings of life's impermanence and death's inevitability. Or you might see kittens. Thankfully at Gong Korean Charcoal Barbecue restaurant on 171A Hutt Street, the flames are accompanied by delectable meats on sticks. 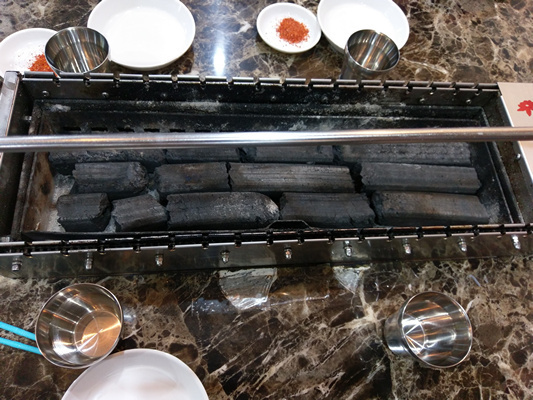 Enter Gong Korean Charcoal Barbecue and one is immediately ushered to a marble table. 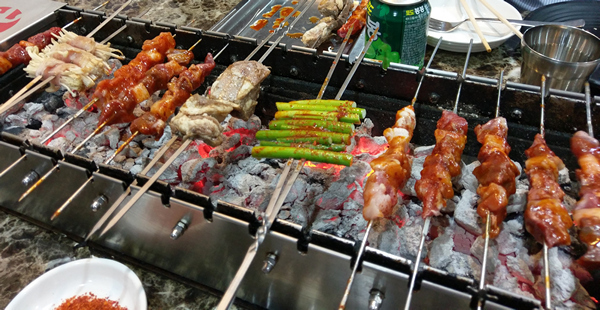 Situated on the table is a rectangular contraption whereby charcoal is lit, a ventilation system keeping the charcoal toasty is activated, and metal skewers of meat are placed on a conveyor belt-type apparatus which slowly rotates each individual skewer, thus allowing for even charring to occur. It's proving difficult to explain, but think of a spit roast for individual satay/shish kebabs arranged in a slowly revolving row. Garlic shoots, Chicken and Beef. Open from 5:30pm to 11pm each day, one places an order for the type and number of skewers, ranging from lamb, chicken, pork, mushrooms, garlic shoots or seafood on a stick (for a few dollars each), and within minutes a tray of raw meat on specially designed metal skewers is delivered to the table. 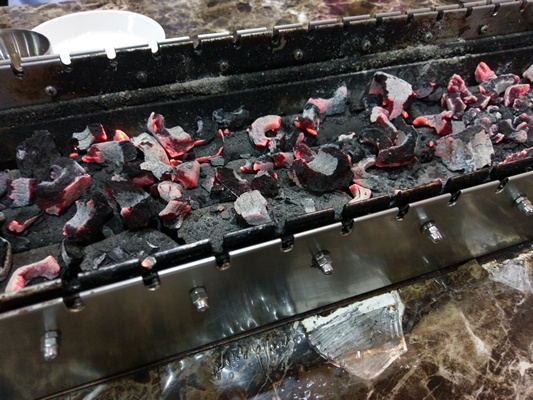 After placing the skewers on the unique revolving spit roasting charcoal system, you are then treated to the hypnotic sight of glistening meat slowly rotating above red hot embers. Occasional dripping fat causes split second flare-ups and smoke to baste the slowly revolving meats. Enoki mushrooms wrapped in pork belly slices, beef rib, garlic shoots, chicken skewers and beef skewers. 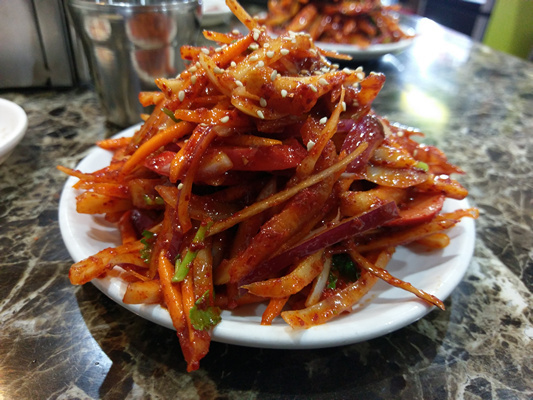 Apart from the skewered morsels, a kaleidoscopic array of other choices is available including traditional bibimbap, pancakes, rice cakes, soup, fried chicken and spicy salads. At the back of the restaurant is a fridge with Korean drinks such as grape drinks, soju, and rice soda. 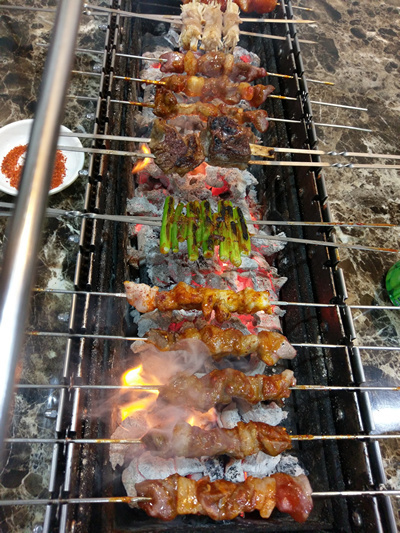 Prices are reasonable and depend mainly on how many skewers one decides to order or is unable to resist after a few too many cups of soju. The preparation allows, as expected, for a satisfying juicy succulence and char with savoury flavours, enhanced with spice mixes and dipping sauces (including ssamjang and gochujang - spicy soybean pastes which are staples in Korean cuisine). 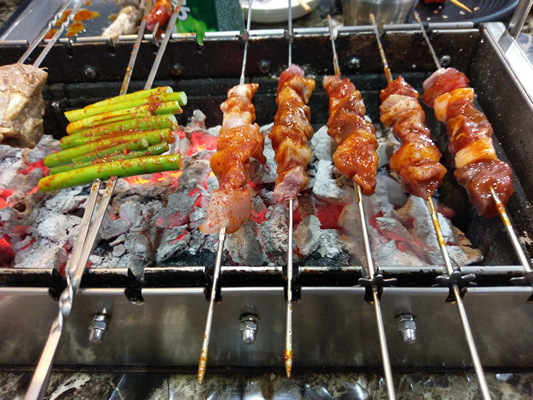 If you're on Hutt Street and hankering for a few skewers of barbecued meat, Gong Korean Charcoal Barbecue provides a distinctive barbecue experience for an affordable price.